Used for hundreds of years for its medicinal benefits, wild cherry bark tea has been prescribed by ancient herbalists for any number of ailments. While the Native Americans utilized tea brewed from the inner bark of the wild cherry tree to help assist with lung ailments as well as diarrhea, ancient Chinese herbalists used it as a remedy for coughs. Today, it can be enjoyed on its own purely for the taste, or used for other various medicinal reasons. The cherry tree has many different variations which grow all over the world. It is more known for its tasty fruit and eye-catching flowers rather than for its bark, however, the bark is the part that is believed to contain the most healing power in many cultures world-wide. 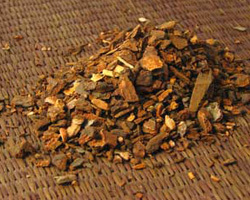 The most popular way to utilize the remedial properties of this bark is by brewing it into a hot tea. Although this tea isn’t exactly appealing in taste, many find the flavor easy to doctor in return for a convenient way to ingest this useful herbal supplement. As a cough suppressant and respiratory aid, wild cherry bark tea is excellent. It has been shown for hundreds of years through anecdotal and clinical evidence to work as an expectorant, clearing out air passages and fighting various respiratory ailments. Drinking it as a respiratory supplement is fairly common among many modern herbalists since it has been known to help cleanse the respiratory system. 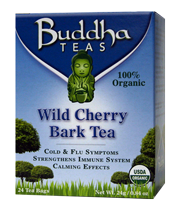 Wild cherry bark tea is one of many herbal teas that can also be used for its sedative properties. The relaxing properties of this tea can affect the muscles of the body, easing tension and stress. This can also be a benefit for women who are experiencing abdominal tension or cramps. 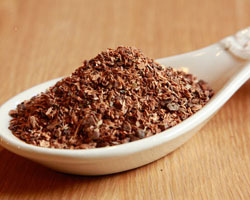 Drinking a cup of wild cherry bark tea can be useful in easing the muscles of the uterus. 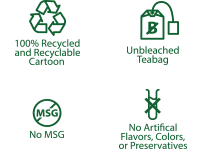 There are many other benefits that can be earned from drinking a cup of wild cherry bark tea. Among these, it is prominently used as a digestive aid among herbalists, often recommend to aid with common issues such as diarrhea, indigestion, and gas build up. A cup of this herbal tea can be helpful after a heavy meal, by supporting and encouraging proper digestion. To prepare wild cherry bark tea, you can place one teabag of wild cherry bark in one cup of boiling water, and let it steep for about ten minutes or according to taste before straining it. Since it can have a somewhat bitter or strong taste, you can add honey and lemon to the tea for a smoother and brighter flavor overall. Since wild cherry bark tea contains hydrocyanic acid, it's important not to overdo it with this type of tea. Although it is fine in moderation, prolonged use could be somewhat dangerous, and it's recommended to only stick to three cups of tea per day when you are using this as a natural cold remedy or for other reasons. If you are concerned about these effects, it's a good idea to speak to your doctor before drinking wild cherry bark tea. It's also not recommended for nursing or pregnant mothers to drink tea made from wild cherry bark, and it should not be given to children under the age of two. Wild cherry bark tea has been around for hundreds of years and has a few good uses that herbalists will recommend it for.